It is important to stop perpetuating misconceptions about the current crisis (i.e., that it’s a sectarian conflict or proxy war among Iran and Saudi Arabia) that make for a good – albeit largely unfounded – story. Houthis march in celebration of the Prophet's birthday, Sana'a, 2013. Luke Somers/Demotix. All rights reserved.Watching the media coverage of Yemen’s most recent crisis, it is easy to get a sense that a radical, Iranian-backed and relatively new rebel movement has seized control of the government in a coup d’état. Media reports tell us that the Houthis, a movement associated with the Zaydi branch of Shia’a Islam, is a new group that engineered a coup – and that they are inadvertently creating new opportunities for Al Qaeda in the Arabian Peninsula (AQAP). Much of this is at best half-truth and requires some crucial corrections. The Houthi movement is not, as recently portrayed in the press, a new or formerly-marginal group. The Houthis fought and won or survived six rounds of conflict with the Yemeni military between 2004 and 2010. But the group was first founded more than three decades ago as essentially an ethno-religious pride organisation dedicated to ensuring that Zaydi youth in northern Yemen didn’t overlook – as had Sunni-crafted textbooks – the more than 1,000 years that Hashemite Zaydi imams ruled much of contemporary Yemen. This movement, known then as Shabab al-Mumin (Believing Youth), eventually turned political and, starting in 2004, involved anti-government protests against the government in Sana’a for its collaboration with the United States, Israel’s most powerful foreign backer. It was a government crackdown on these demonstrations that ultimately led to violence and the strengthening of a militant wing, known as Ansarullah, around the Houthis. While much of the media coverage suggests that the Houthis engineered a coup, it is important to note that they have generally been hesitant to govern. As Helen Lackner noted in a recent article, the Houthis could have easily seized control of the capital and taken over the government, and could have done so months ago. Instead, they chose – since first entering Sana’a in September 2014 – to slowly encircle President Hadi and his government in hopes that they would form what Lackner calls a ‘puppet’ government to present to the international community. It appears that President Abdu Rabbu Mansur Hadi, his prime minister and his cabinet all resigned not due to pressure from the Houthis. Instead, they resigned to spite the Houthis and essentially to put the ball back in their court – letting them sink or swim in the quagmire they had helped to create. Even in parts of the Sa’ada governorate in northern Yemen long controlled by the Houthis, the movement has been unwilling to govern in a comprehensive sense and instead has allowed the central government and foreign aid agencies to continue providing key services. Yes, the Houthis have provided security and have adjudicated disputes through efficient local courts, but they have not tried to provide basic services in the same way that Hamas does in Gaza or Hezbollah does in parts of Lebanon. This is because the Houthis have relatively little recent bureaucratic or legislative expertise, lack the resources to undertake large-scale service provision, and acknowledge that their popularity could wane if they try and fail to deliver public goods. This is just what President Hadi had in mind when he resigned: the Houthis will either fail to run the government effectively or will withdraw rather than take on the country’s myriad political, security, and economic challenges (several of which Lackner discusses in her recent article). Much of the media has reiterated this suspicion that the Houthis are essentially an Iranian proxy or client along the same lines as Hezbollah and are intended to threaten Saudi Arabia. While relations between the Houthis and Iran are primarily a matter of speculation, it is important to note a few things. First, the Houthis are deeply proud and opposed to external interference and would be unlikely to follow any dictates from Tehran. Second, the branches of Shia Islam practiced among Iranians and Yemen’s Shia’a are different, and Zaydi Islam is generally closer to the Shafi’i school of Islam practiced in Yemen than it is to Iran’s Twelver Shi’ism. Thirdly, the Houthis have not demonstrated the sorts of generous financial resources or relatively sophisticated weaponry that Iran traditionally bestows upon its clients in Syria and Lebanon. Lastly, aside from a brief period in 2008-2009, the Houthis haven’t necessarily entered Saudi soil or taken any actions against Saudi Arabia – as one would expect if the group was part of an Iranian plot to destabilise the Kingdom. Much of the suspicion about Iran’s role comes from US and Saudi officials who see Iran around every corner. In early 2013 the US and Yemeni governments reportedly seized some Chinese-made weapons that they claim were from Iran and bound for the Houthis. However, little evidence of the Iranian connection was ever released, and the US has a history of attributing weapons to Iran with little evidence (and even where allied intelligence agencies reach fundamentally different conclusions). It would be exceptionally difficult for Iran to smuggle vast amounts of weapons to the Houthis given the sheer logistics involved, and the fact that the weapons would need to circumnavigate the Arabian Peninsula and head through some of the most heavily patrolled waters in the world. Besides, as one of the best armed countries in the world – and a recipient of US military assistance – it’s not as though the Houthis didn’t have alternative sources of weaponry. Furthermore, the Houthis have enough of an ally in former President Ali Abdullah Saleh, who stepped down amid the Arab Spring but who retains significant control over parts of the country’s security services. Saleh instructed his loyalists in the military and in elite security units to step down both last September, when the Houthis first entered the capital, and in recent weeks as they rather easily surrounded numerous key government institutions. 4. 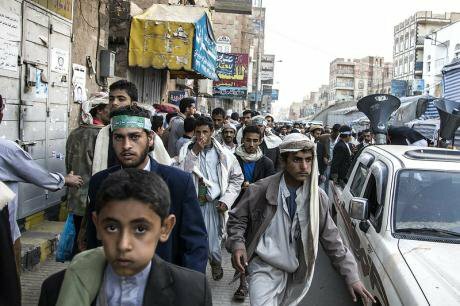 AQAP or IS could benefit from the chaos, but terrorism in Yemen is hardly the Houthis’ fault. AQAP, based in Yemen, is widely considered the most capable Al Qaeda franchise. The group has long benefited from the absence of government control over a significant portion of Yemeni soil, and further chaos could expand the AQAP’s ability to operate with impunity. But let’s be careful not to blame this too much on the Houthis’ actions over the past several months. AQAP has long had an ability to operate relatively freely in parts of Yemen, particularly since the country’s security services fragmented among different political factions during and since the 2011 Arab Spring demonstrations there. Indeed, if anyone is enabling AQAP, it’s not the Houthis but instead former President Saleh and those other powerful political figures, particularly the al-Ahmar family, who refuse to help de-politicise the security forces and allow them to operate more effectively. Furthermore, radical Islamic clerics friendly with past and current regime figures in Yemen – and Saudi support given to increasingly radical forms of Sunni Islam there – owe much more credit for cultivating and enabling AQAP. If anything, the Houthis are going to be a potent ally in helping to counter AQAP and perhaps Islamic State if they gain a meaningful following in Yemen (which is something else the media has reported based on relatively sketchy information). All of this isn’t to say that the Houthis are necessarily behaving responsibly by taking the government and parts of the capital hostage. The group has a demonstrated history of human rights abuses against non-Zaydis and perceived opponents, in particular in areas it controls. And violent repression of public dissent is already visible, according to Lackner. But it is important for the media to stop perpetuating misconceptions about the current crisis (i.e., that it’s a sectarian conflict or proxy war among Iran and Saudi Arabia) that make for a good – albeit largely unfounded – story.